You'll Love Being An Inner Circle Member! No other membership site gives you so much for so little. My Inner Circle costs less per year than many comparable membership sites charge per month. What exactly do you get with a membership in Boogie Jack's Inner Circle? Deep Discounts! The deepest discounts I ever offer on my products are to Inner Circle members. From sales on current products to low introductory prices on new products, Inner Circle members usually get from 25-60% off the public price! Free Products! Shh, our little secret ... sometimes I give no-catch free products to members. There are products in the members area now that I sell to the general public, but are free to members. I LOVE my members—they're the BEST! More Free and Almost Free Stuff! From time to time I buy the rights to other people's products. If the rights I receive allow it, I give these products to Inner Circle members. If not, I sell them for pennies on the dollar. You too could receive hundreds of dollars worth of free and nearly free products each year. Contests and Drawings! From time to time I have contests and drawings with cool prizes. You could win some really cool stuff. I've given away Demo Builder Pro ($498.00 value), PhotoZoom Pro 2 ($149.00), Instant PhotoArtist ($59.99), Font Creator Professional Edition ($149.00) and many other commercial software programs and ebooks, plus my own products. I've given away over $80,000 in prizes so far—you could be a winner in the future! HTML, CSS, and XHTML Tutorials Galore! If you like the web design tutorials on this site, you'll love the super high-quality tutorials in the members area. There are a ton of them now, but I'm working on version 3.0 of the member site and when it's launched you'll go nuts with all the new tutorials. You've likely never seen HTML, CSS, and XHTML explained so well and so easy to understand. Whether you're new to web design or have years of experience, you'll find this part of the member site is worth joining for in and of itself. Web Design Reference Charts! There are over 30 absolutely superb HTML, CSS, and other reference charts on the inside. You'll find everything you need and more. Webmaster's Q & A! I've been writing and teaching web design since 1997. I've written three books and over 700 newsletters, and in this part of the member's site I answer YOUR questions. When I get questions I think would benefit my readership, I answer them here. Web Site Promotion Articles! Besides writing about web design, I also write about web site promotion, internet marketing, search engine opimization and matters related to succeeding on the internet. I started in 1997 and earn my full-time living online—you can benefit from my knowledge! Are you getting the results you want in life? A great many people have told me they signed up to my newsletter for the website design and promotion content, and while they like that part just fine, they end up liking Life's Little Goodies even better. Due to popular demand, my Life's Little Goodies column has been archived for members. Life's Little Goodies is about getting better results in our lives, having better relationships, and being happier ... but you can skip this section if it isn't for you. I will add though, that I've received emails from many different people who have told me that the "goodies" have changed their lives for the better. Stop the Presses! The Value of Joining Just Increased by a Power of 10! I bought reseller rights to 10 other membership sites. That means I can sell memberships to them—or give memberships away! I don't own the sites or control the content, but I am GIVING you a FREE silver level membership to all 10 sites when you join my Inner Circle! Go ahead and check out the sales pages. The links will open in a new window or tab depending on your browser. Did you notice the cost of joining these sites is $27 each. That's 10 sites x $27 = a $270 value I'm giving you for free just for joining my Inner Circle—and don't worry, joining the Inner Circle doesn't cost anywhere near $270. Even that's not all. There are some big things planned that I don't want to announce just yet. Suffice it to say that they will be mutually beneficial. Any intelligent person can clearly see there are great advantages to being an Inner Circle member. With excellent reasons to join like those outlined above, combined with the low membership cost, joining is obviously a very smart move. That's why the renewal rate is about 90 percent—far higher than most membership sites can boast. Most membership sites charge from $17.00 - $27.00 each month, and many are even higher. Prices between $47 to $67 per month are not unusual, and I've even seen some at $97 each month. If I said it only cost $10.00 a month to join any fair-minded person would think that's pretty reasonable. If I said it was just $5.00 a month you'd know for sure it's more than fair. 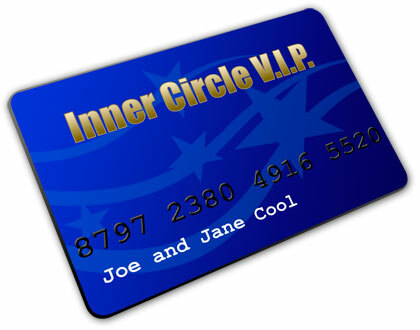 Here's the deal ... an Inner Circle membership is barely a dime a day. You may think I'm crazy, but you know that is a fantastic price. Don't let the low price fool you though, the content is excellent and the benefits are plentiful. A basic membership is only $37.00—and yes, that is for ONE FULL YEAR! Actually it's for more than one year because if you join now I won't start counting down your year until the new member site opens. You'll get access to the current member site and all the tutorials and the current freebies right now, and Inner Circle 3.0 for one full year once it opens. The price will be going up. That's not a marketing ploy. I have version 3.0 of the member site about half finished. When version 3.0 is complete the price is definitely going up. Join now and you'll be locked in at the lowest price available. You'll keep that price as long as you're a member in good standing—and you WILL want to remain a member because you're going to get a ton of great freebies during the coming year! ...or add a bonus package to your membership and save up to 73% on some of my most popular products if you join right now. * Cost savings for Lifetime memberships can't really be calculated because your savings increase each year due to no renewal fees. Cost savings calculations includes the cost of joining the other 10 membership sites in addition to the Inner Circle. Those aren't made up prices to inflate the value of the offers—you can check all the prices I listed. Those are all products sold here or on my i-webmaster.org site every day, except the other 10 member sites, and you can see how much they sell for on each site. This is REAL savings on REAL products to give you a REAL value-packed OPPORTUNITY! PS - You won't find another resource that makes learning any easier or more fun (that's why my book is used as the teaching text in hundreds of schools). Give yourself a gift today, you deserve it I'm sure, because I believe everyone deserves good things in life. Yikes - you have been busy! If you haven't given yourself kudo's - do so now. Your body of works are amazing! If content is king your crown is on the way. I like the clean design, the content speaks for itself. WOW!!!! The new members site is truly amazing. You have always been the one I turn to when I need help or info, and the cost of being a member is well worth it. I have used many of your tips and programs in the sites I have done. Thank you for making them available. I can't see how you can improve on what you have done but, knowing you you will find a way! Keep up the great work. I would definitely recommend you to any and all. I would be honored if you would want to use any of my comments as testimonials. I love your tutorials. They are the easiest to understand I've found, and believe me, I've seen plenty! The reference charts are great. I'd never seen such comprehensive, yet easy to understand, HTML and CSS charts. These alone are worth joining for, everything else is gravy. I love your new site. I have been a member of your old site for quite some time now. One thing I think is really good is the very front page. It lets people know right up front whether it would be worthwhile for them to become a member. The table helps people decide whether the web community is right for them and reflects what you have always done - be honest, open and upfront with people - thanks for that. All the best with your new site! Wow! The new site is great. It's packed with informative pieces written in understandable language. It's well-organized information, laid out in perfect format to allow fast navigation right to the specific points of interest. And it's very pleasant to the eyes. Thank you for all the hard work you've obviously put into the presentation of these tips on website construction as well as the thoughtful advice regarding just living life as an acceptable fellow planet dweller. Where else is all this offered in one compact, easy-to-access compilation of data? As a lifetime member, I am excited about the final product. I have not one suggestion to make the site better; you're doing an excellent job without me! I have been a lifetime member of yours for almost two years now and have enjoyed the hints, tutorials, and other tidbits that you provide to your members. You have always been responsive to both questions and feedback. This new web site is nothing short of awesome. It's well constructed, easy to navigate and chock full of useful information. I love that a lot of reference information is available at one location and it's from a reliable source. I look forward to seeing further developments. Thanks! I just cannot say enough nice things about all your stuff. I like the new look a lot - I tend to be a minimalist so the simple layout and use of lots of white space appeals to me and will bring me back. I really like that I can very quickly discern exactly what's offered on the entire site and that there's a quick overview in case I'm not sure what the section title refers to. Nicely done and Thanks for a lot of great stuff. As ever my friend, you've brained 'em. The site is content-rich, friendly, easy to navigate and, best of all, simple. I like the site and how it's setup. As always, you make it easy to navigate and find items. I recommend your newsletter to our other Automation Relations Specialists who work at the hospital. A finer piece of instructional material has yet to be discovered by me. I vote yes. I just visited the new member site and must say that I love it! You've got lots of great content, enough to keep someone busy for a while. Great navigation, too. Keep up the great job. Looks great - easy to navigate, and that's so important given the richness of content you offer. Great new site. Spent a bit of time this morning looking around. It amazes me how much information you provide and how logical your navigation is. Poor navigation is one of my bug-a-boos. New site is excellent, love the colors, navigation, and simplicity of it all. Makes me want to do some redesigning on my own sites! All emails are on file. Those are just a few of the comments I received after I opened version 2.0 of the member site. In a few weeks version 3 will be ready to go, the price will go up unless you're locked in as a member, and in the words of member Jeff Mason, I'm going to "brain 'em" again because it will be even better still! So what are you waiting for? If you've read this far you know darn well you want to join! You will be glad you did.